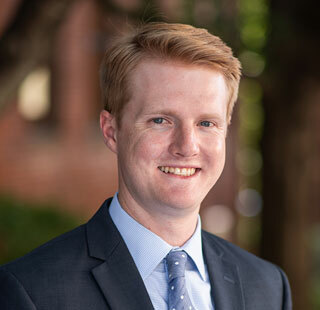 Mitchell Appleby joined Davis, Snyder, Williford & Lehn in July, 2018, having clerked for the firm five summers during college and law school. His extensive internship experiences confirmed his passion for defending healthcare clients and honed his litigation skills. Mitchell attended Clemson University where he received a B.A. in Communication Studies and participated in Mock Trial. He received his law degree from the University of South Carolina School of Law. During law school, in addition to clerking for Davis, Snyder, Williford & Lehn, Mitchell also clerked for Lynn Leonard & Associates in Atlanta, the legal department for State Farm Insurance Company. While at Lynn Leonard & Associates, Mitchell worked on premises liability and automobile accident liability matters. During his final year of law school, Mitchell clerked for Taylor/Potterfield where he focused on family law matters, including divorce and child custody disputes. Mitchell also was named to the Dean’s List several times during law school for his academic achievements. Mitchell is a native of Greenville and is blessed to have returned home with his wife, Haley. Mitchell enjoys spending time with family and friends, playing and watching a multitude of sports, tailgating on Saturdays in the fall when his beloved Clemson Tigers are at home, exercising, watching movies, and traveling.